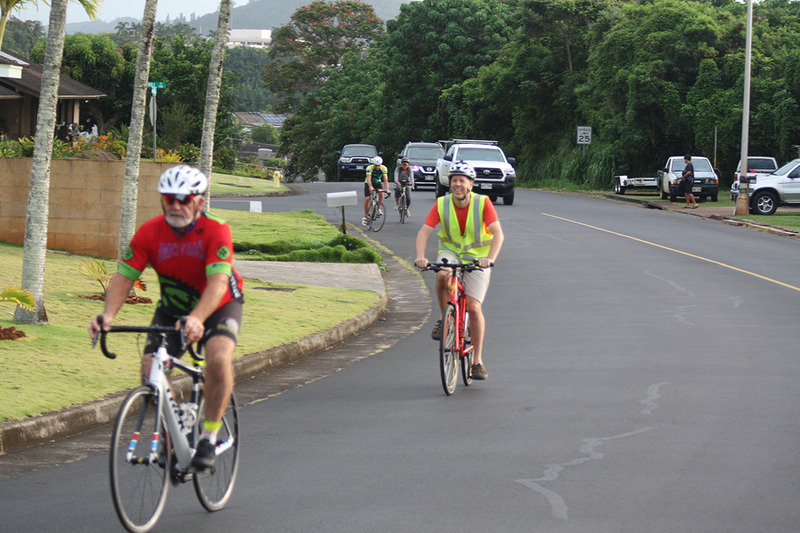 LIHUE — More than 50 people biked to work Friday, with groups from Kapaa and Puhi meeting in Lihue during Bike To Work Day. The social gathering took place under cloudy skies and light winds to celebrate National Bike Month and bring awareness to the benefits of biking. “It’s easier than it looks once you make it a habit,” said Chet Myers, who took part in the Puhi ride. “You start doing it a few times, and you don’t have to think about it anymore. Myers lives in Lihue and has biked to work almost every day for the last eight years, except when it’s raining hard. He keeps a fresh change of clothes at his optometry office on Ewalu Street. With a bike lane the whole way, his short commute travels through a school zone, where traffic is not moving fast. Mark Walsh also bikes to work when the weather’s nice. He lives in Lihue and has about a 30-minute ride to work at the hospital. He joined the Friday group on the three-mile ride from Puhi Park with his wife, Terry. It takes Walsh maybe 20 minutes more to bike to work than it would to drive, but he likes not having to sit in traffic congestion. The couple likes to join the biking community and get to know everyone through social group rides like these. Squad leaders and safety officials were also accompanied on bikes by members of the police and fire departments, who also enjoyed the slow-paced ride. Her bike tire blew out on the bridge after they came off the Cane Haul Road. Four people stopped to assist her, and a police truck delivered her and her bike to the ending point at the Lihue Civic Center. The two groups ended the ride there at the rotunda with socializing, food and refreshments. There were fun prize drawings of gift cards, water bottles, and hats for riders. Funding for the event came was due in part to the State Department of Health, Hawaii Public Health Institute and Get Fit Kauai. The ride is followed up with an all-day, free Bicycling Skills For Adults class today at 8 a.m. at Kapaa Public Library to educate cyclists on practical aspects of sharing the road.